Im new here and im new to RPing. I played D&D at a friends and loved it, next week i was made DM! This christmas i got the core rules set so have alot of learning to do! I hope here i can get inspiration for my adventures and share some of my ideas when i am a little more experienced at it. About the most quickly promoted and Noobiest DM youll find! Welcome Jon! You have certainly come to the right place! One thought to keep in mind: we are "idea heavy", "rules/game specifics lite". But you will certainly be innundated with inspiration and ideas for your games!! Wow really thrown in the deep end by your friends, how are you liking it? From game to DM in one session. That sounds like an article of the experience. Welcome to the site. Hope you find plenty of things for your new DM appetite...they are the most voracious. I'm liking it, but I'm not really good at making my own adventures. 1.) It's easy to give the players what they want, but hard to take it back. Never satisfy all of their characters' desires; instead, keep them "hungry" for more. As an example, I once ran a game where one of the players wanted her character to have a griffon to ride. She set out on a quest to find one and (voila!) had a griffon. If I were running the same situation today, I'd have strung that out over five or six adventures. She would need to seek out the region where they could be found, find someone who could help her tame and train it, acquire the rare and exotic saddles and other gear needed, and actually capture a fledgling griffon. Additional adventures would follow, as consequences of her actions. I could have built that simple request into a season of campaigning. You get the idea. Always think of what will happen after they get what they want. 2.) Think in terms of how stories are structured. Everything has a beginning, a middle, and an end. Remember, the PCs are the heroes of the story, so write adventures with an interesting hook (Beginning: What inspires the PCs to act? What goals do they have? ), a series of challenges/difficulties (Middle: What obstacles do they have to overcome? ), and a sense of conclusion (End: What will result from this?). 3.) Heroes make hard choices. Present the players with decisions to make: Do we chase the bandits or help the merchants? Do we trust the princess or believe her guards' muttering that there is something wrong here? 3.) You will make mistakes. Don't worry about them. Nice to see a new face every now and then. Consider yourself welcomed! If you have trouble making your own adventures, look no further. This is the place to be at. And if you have adventure ideas that you want help with, just ask! Don't let the sight overpower you, at one point we all started out bad(personally, I believe I still am a bad DM but hey, these guys care more about a good story line than anything) Quite a few people would be more than willing to help you out in your DMing. And by the way, watch out for Ria Hawks flying purple monkeys, they fling poisonous... well, what monkeys normally fling. Hello DMJon, i know you becasue i am you. You are here? And have not yet been fed?! Quickly, the Plate Lunch Special! Chicken Katsu! 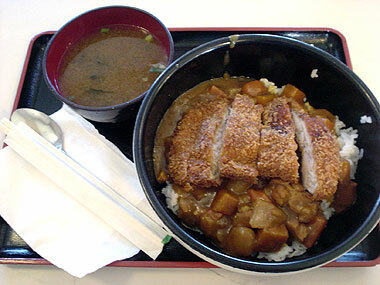 With delicious Tonkatsu sauce! Eat up, son. Page created in 1.618 seconds with 33 queries.